It’s a good thing that Mitchell Demeter owns a moving company. He needs a way of getting a 750-pound Bitcoin ATM off a wooden pallet, so it can be anchored to the floor in this Vancouver coffee shop. Demeter is one of three partners who have shelled out more than $90,000 to buy five ATMs that handle bitcoins, the world’s most popular digital currency, and today they’re going through the steps of installing their very first one at Waves Coffee, right next to the provincial courthouse in downtown Vancouver. As far as we know, this will also be the first operational Bitcoin ATM on the planet. Trading bitcoins for cash is a bit of a grey area, as far as financial regulations are concerned. In the U.S., companies that do this typically need to register as money transmission businesses with both state and federal regulators. In Canada, however, the regulations aren’t so onerous. That’s why the machine is making its debut here. 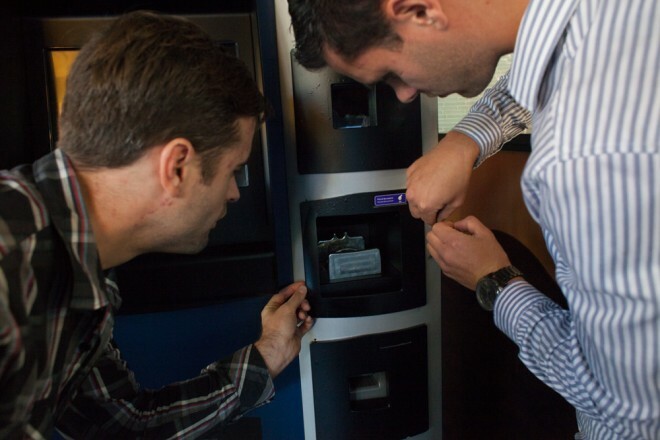 With press and curious onlookers watching, Demeter and his business partner spent about an hour this morning unpacking their brand new ATM, built by a Nevada company called Robocoin. The machine scans your palm and then will sell you bitcoins for cash — or vice versa. It’s set to go live tomorrow. Until then, they have a day to test that it works, connect it to a bitcoin exchange, fill it with money, and, of course, anchor it to the ground. When operational, the machine will be able to do up to 3,000 Canadian dollar worth of transactions per day. You don’t need any form of identification to use the ATM, but it comes equipped with a palm scanner, that’s used to make sure that users don’t exceed the 3,000 per day limit.